Museums are places that invite reflection on history, community, and identity. They foster learning and promote education, fuel the imagination, and arouse curiosity. Museums transport audiences through time and across space, shaping the understanding of the world, past and present. In a museum, objects tell stories, and storytelling produces memory. How does a museum represent the past? Who gets to tell the story? What is included, what is excluded, and why? For all these important functions of a museum, Ergon’s inaugural publication directs attention to this crucial cultural institution. 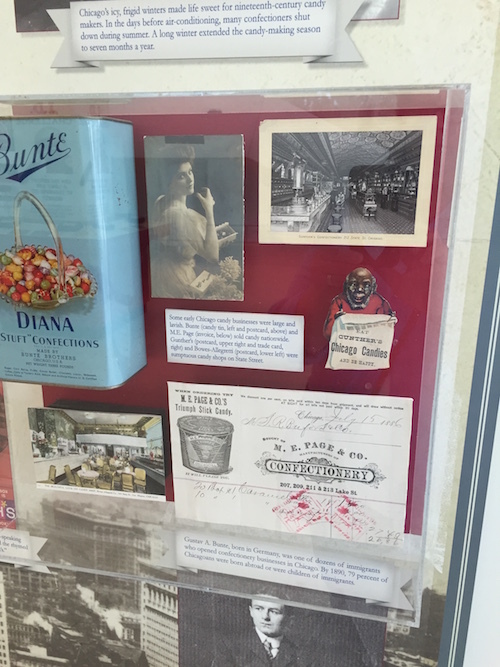 In November 2016, anthropologist David Sutton visited the exhibit entitled “Sweet Home Chicago: The History of America’s Candy Capital” at the National Hellenic Museum in Chicago, one of the most prominent museums in Greek America, and shares with us his insights and analysis. A scholar who has written extensively on the foodways of Greece, particularly the island of Kalymnos, Sutton walks us through the exhibit, comments on the stories it tells, and identifies the angle through which it narrates the history and role of Greek Americans in the sweet shop and candy business in the United States. Museum exhibits have been proliferating in Greek America, appearing in permanent museums that have been established by local communities—on a variety of scales—in cities such as Chicago, Saint Augustine, Salt Lake City, and Portland, among others. The initiative to establish a museum in New York City is still in the making. Temporary exhibits enjoy public visibility too, as regional and county museums across the country host Greek American material. The Greek Museum of Berrien County, Michigan, is one example among several. Exhibit material ranges from women’s embroideries to objects related to wedding rituals, and from artists to Greek American patriots. In some cases, these initiatives enjoy the support of the wider community, while in others, they solely represent the work a few individuals committed to historical preservation. This interest is certainly an expression of a wider “grass roots preservation movement” (Frangos 2006), which also includes historical societies, oral history projects, the making of documentaries, and the writing of memoirs and family biographies. But it is not uncommon for scholars to turn exhibit curators in the interest of making Greek heritage public. In addition, museologists in Greece have recently expressed interest in exhibiting Greek America. How do these exhibits represent Greek America? Who determines what merits display and what waits in the storage room? There are no ready answers because there has been no extensive reflection on this topic. Yet these questions matter because of the power of the museum to produce historical memory—whom and what does a community decide to remember; to shape identity—how does a community see itself; to shape public opinion—how does a community want to be seen by others. But what happens when a community’s story about itself harms other communities? We at Ergon showcase this topic to attract public and scholarly interest, as well as to foster public conversation on the conservation, documentation, and exhibiting of U.S. Greek heritage and history. In an age that celebrates heritage, we must seize the opportunity to expand Greek America’s museum presence and provide a venue for public reflection on the issues that such visibility engenders. Anagnostou, Yiorgos. 2004. “Private Heirlooms, Public Memories: Tradition and Greek America as Translation.” Gramma: A Journal of Theory and Criticism 12: 109–125. Anagnostou, Yiorgos, and Nikos Poulopoulos. 2017. “A Museum Narrative of Greek America.” Unpublished work. Summer. Frangos, Steve. 2006. “Exhibiting the Greek American Experience, Community Keeps its History Alive.” The National Herald 25 November. Leontis, Artemis. 1995. “Fabric Arts in Greek America.” Laografia: A Journal of the International Greek Folklore Society 12 (3): 5–11. ———. 2008 “Greek American Identity: What Women’s Handwork Tells Us.” In Hellenisms: Perceptions of Greek Ethnicity from Antiquity to Modern Times , edited by Katerina Zacharia, 379–398. Ashgate.